Ready for the Summer Heat? 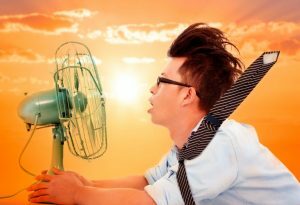 Preparing your employees for hot temperatures will help prevent common heat exhaustion related issues. In this article we provide 8 quick tips to help you prevent heat stroke. #1. – Wear loose fitting, lightweight clothing. Wearing excess clothing or clothing that fits tightly won’t allow your body to cool properly. #2. – Protect against sunburn. Sunburn affects your body’s ability to cool itself, so protect yourself outdoors with a wide-brimmed hat and sunglasses and use a broad-spectrum sunscreen with an SPF of at least 15. Apply sunscreen generously, and reapply every two hours — or more often if you’re swimming or sweating. #3. – Drink plenty of fluids. Staying hydrated will help your body sweat and maintain a normal body temperature. #4. – Take extra precautions with certain medications. Be on the lookout for heat-related problems if you take medications that can affect your body’s ability to stay hydrated and dissipate heat. #5. – Never leave anyone in a parked car. This is a common cause of heat-related deaths in children. When parked in the sun, the temperature in your car can rise 20 degrees Fahrenheit (more than 6.7 C) in 10 minutes.It’s not safe to leave a person in a parked car in warm or hot weather, even if the windows are cracked or the car is in shade. When your car is parked, keep it locked to prevent a child from getting inside. #6. – Take it easy during the hottest parts of the day. If you can’t avoid strenuous activity in hot weather, drink fluids and rest frequently in a cool spot. Try to schedule exercise or physical labor for cooler parts of the day, such as early morning or evening. #7. – Get acclimated. Limit time spent working or exercising in heat until you’re conditioned to it. People who are not used to hot weather are especially susceptible to heat-related illness. It can take several weeks for your body to adjust to hot weather. #8. – Be cautious if you’re at increased risk. If you take medications or have a condition that increases your risk of heat-related problems, such as a history of previous heat illness, avoid the heat and act quickly if you notice symptoms of overheating. If you participate in a strenuous sporting event or activity in hot weather, make sure there are medical services available in case of a heat emergency. Call Now to see how our line of seasonal products can help you beat the heat!